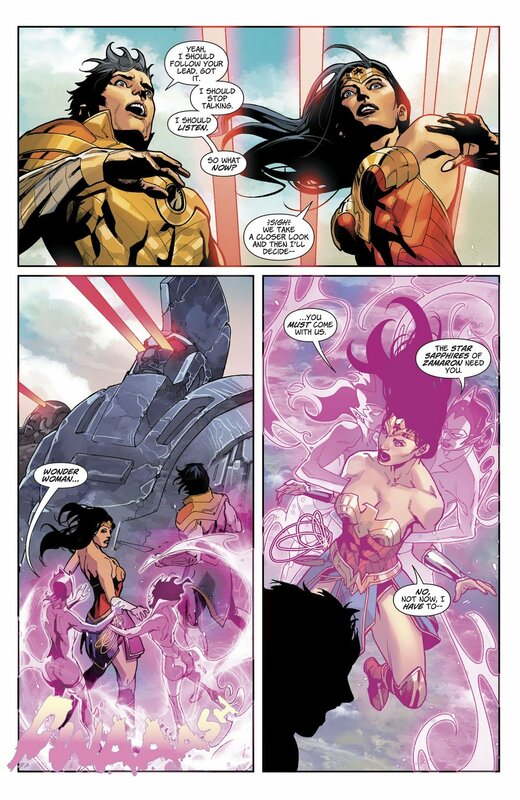 Wonder Woman #47, by writer James Robinson, art by Stephen Segovia and Rick Leonardi, and colors by Romulo Fajardo Jr., is part two of The Dark Gods arc, and Robinson’s strange pacing continues to plague this book. Previously, Cheetah and Supergirl went crazy, claiming that the Dark Gods were coming, and attacking Wonder Woman. This issue sees the continuation of her fight with Supergirl, but the story barely manages to move forward, and ends with a head-scratcher of a cliffhanger. As the previous issue’s cliffhanger promised, this issue is largely devoted to the fight between Wonder Woman and Supergirl. This should be an exciting leg of the story, because the readers rarely get to see these two powerhouses throw down, but Robinson somehow manages to make it feel like a repeat of the Cheetah fight from last issue. Wonder Woman is attacked by someone she knows, who is going on about “Dark Gods” coming to Earth, Diana fights this person off, and gets next to no answers in the process. Same beats, same lack of advancement in story. Not only that, but the fight ends off-panel, so there isn’t much satisfaction to be had with the action side of things, either. Fortunately, Robinson’s pet character Jason (Diana’s brother) finally gets some answers about his mysterious armor and his memory gap. This character is clearly the solo book Robinson wants to be writing, because he is the most compelling part of this entire run. It’s essentially Jason’s story from top to bottom, with him slowly becoming the hero he so desperately wants to be. While it is nice that Jason is a well-rounded character, it has essentially left Diana being a supporting character in her own book. Yes, she is ultimately still the hero, but all of the development is happening on Jason’s side of things. Case in point, he is the one that gets answers this issue, when he goes to the oracles and finds out the origins of his armor. The art by Stephen Segovia, with breakdowns by Rick Leonardi, continues to amaze. Rarely are artists so pitch-perfect for a book, but these guys knock it out of the park every time. They continuously deliver a delicate balance of great action storytelling and excellent acting in their characters’ facial expressions. The colors by Romulo Fajardo Jr. are also well-rendered. He has a tendency to go a little too dark in the darker scenes, but in the bright day of light, his colors really add to the art, and elevate it to the next level. In the end, this was another disappointing chapter of Wonder Woman from Robinson. The shift needs to come back to Wonder Woman and really focus on her being the hero of her own book. Even the end of this issue, while meaning to set up the upcoming annual (why in the middle of this arc? ), really only seems to serve the character of Jason and his hero’s journey. Hopefully, Robinson can bring it back to Diana and fix his consistently-wonky pacing before the end of this arc, or it won’t even be worth finishing.